Me, too, so it was great to be left it. 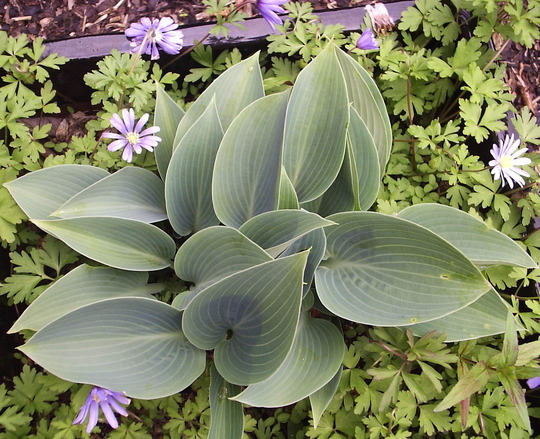 It comes up in a black glazed square planter in the front garden, just as the blue anemone blandas are dying off. It looks like a blue hosta, David... perhaps Bressingham Blue or Blue Cadet or Blue Boy... I have a blueboy just starting out...they seem a little slower to emerge than the green varieties. just took a close look and if you're up for it...you could divide that clump and have about six plants, maybe? 3 Halcyons now bedded down in Haven !